FIRST PRINTINGS OF 3 TITLES IN THE ROBOT SERIES (I ROBOT, THE CAVES OF STEEL, THE REST OF THE ROBOTS) ISAAC ASIMOV, SIGNED WITH LAID IN SIGNATURE. Stated First Edition, First Printings of Three Titles of Asimovs Robot series, I ROBOT, THE CAVES OF STEEL, and THE REST OF THE ROBOTS A very handsome set of the FOUR books in the Robot series, presenting well on the shelf. Each book is in beautiful near fine clean, crisp condition with near fine original dust jackets. I Robot has a laid in bold signature by Asimov. Details for each book are listed below by title. These represent 4 of the 4 scarce titles in the series, all in exceptional condition. 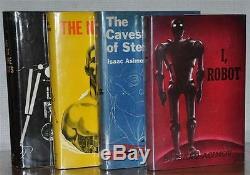 1ST/1ST EDITIONS, SET OF 4 BOOKS, SIGNED I ROBOT, CAVES OF STEEL ISAAC ASIMOV. SET OF FOUR FIRST PRINTINGS, ONE SIGNED FROM THE ROBOT SERIES BY ISAAC ASIMOV 1ST EDITION, 1ST PRINTING, 1ST STATE I ROBOT CAVES OF STEEL THE NAKED SUN THE REST OF THE ROBOTS. Gnome Press, New York, 1950 Doubleday & Company, New York, 1954 Doubleday & Company, New York, 1957 Doubleday & Company, New York, 1964. STATED FIRST Edition, FIRST Printings of the complete Four Titles of Asimovs Robot series, I ROBOT, THE CAVES OF STEEL, THE NAKED SUN and THE REST OF THE ROBOTS A very handsome set of the four books in the Robot series, presenting well on the shelf. These represent all 4 of the scarce titles in the series, all in exceptional condition. I ROBOT: Stunning clean, near fine book with a original near fine vibrant dust jacket, beautifully signed on a laid in signature by Isaac Asimov in blue ink. Only 5,000 copies of the first edition were printed of this iconic title in which Asimovs Three Laws of Robotics were postulated for the first time. The book is in beautiful condition with crisp red boards. Strong Black robot emblem to front, and unfaded black titles to spine. The boards are clean and a vibrant red with no edgewear. The binding is tight and square. The end papers have a neat laid in signature boldly signed by Isaac Asimov in black ink, otherwise the end papers are clean, with no inscriptions, no bookplates, and no bookstore stamps. A beautiful clean, example of this landmark title, appearing as unread! The original first edition dust jacket is in stunning condition having benefited from some very slight restoration by an expert paper conservator and presents as a near fine example. The jacket is bright with vibrant colors, and withOUT most any of the otherwise typical fading in which the red spine commonly turns grey from sun and light damage. This stunning dust jacket has No rips, No chips, No edgewear, No stains, No rubbing and No foxing. Even the white rear panel and flaps are still a bright white with just a hint of toning! Stunning, handsome jacket, very SCARCE in this condition, and presenting the book beautifully on the shelf. THE CAVES OF STEEL: The true First printing of this title requires the first edition statement. Beautiful near fine crisp, clean book with a near fine jacket. The book is in near fine condition with bright blue boards, and red unfaded titles to the spine. The book has clean boards with no corner bumps, but with an edge bump along bottom. A very solid tight copy with no edgewear and a tight and square binding. The end papers are clean, with an tiny stain, otherwise with no inscriptions, no bookplates, and no bookstore stamps. Strong unfaded red top stain applied by publisher. Please see the many detailed images. The bright original dust jacket has benefited from very slight restoration to the spine tips by an expert paper conservator and presents as a near fine example. The jacket has strong vibrant colors and has No edgewear, No chips, No rips, No rubbing, No stains, No tears and No foxing, slight hint of fading to spine. The jacket is now placed in a new clear archival cover. Striking jacket presenting the book nicely! THE NAKED SUN: The true First printing of this title requires the first edition statement. The book is in near fine condition with bright yellow boards, and red unfaded titles to the spine. The end papers are clean with a very faint paper clip stain, otherwise no inscriptions, no bookplates, and no bookstore stamps. Vibrant unfaded red top stain applied by publisher. The bright original dust jacket is unrestored. The jacket has strong vibrant colors and with only a tiny 2mm intact tear. The jacket has No edgewear, No chips, No rips, No rubbing, No stains, No tears and No foxing, and has the typical fading of titles to the spine. THE REST OF THE ROBOTS The true First printing of this title requires the first edition statement. Not the common bookclub and not a later edition. Collection of eight robot stories not in I, Robot , plus reprints the Caves Of Steel and The Naked Sun. Beautiful clean, crisp near fine book with a beautiful jacket. The book is in great condition with, grey cloth boards, with black box and bright orange titles to spine. This is a very thick and heavy book which as such would tend to have alot of edgewear or spine lean issues. This book has no edgewear, sharp corners, beautiful clean cloth with no fading or stains. Slight bump to rear board. The end papers are clean with no inscriptions, no stains, and no bookstore stamps. The original unrestored dust jacket has some light creasing along the stop of the spine, otherwise the jacket has strong vibrant colors with some of the typical fading to the orange title on the spine. The jacket has no other, No chips, No rips, No rubbing, No stains, No tears and No foxing. Slight toning to the inner flaps. Beautiful jacket presenting the book nicely on the shelf! A stunning signed set of FOUR books which is the complete Robot Series, scarce in this condition, and impossible to locate! Show off your items with Auctiva's Listing Templates. The item "1ST/1ST EDITIONS, SET OF 4 BOOKS, SIGNED I ROBOT, CAVES OF STEEL ISAAC ASIMOV" is in sale since Thursday, May 25, 2017. This item is in the category "Books\Antiquarian & Collectible". The seller is "iwc_2004" and is located in New Canaan, Connecticut. This item can be shipped to United States, all countries in Europe, all countries in continental Asia, Canada, Australia.